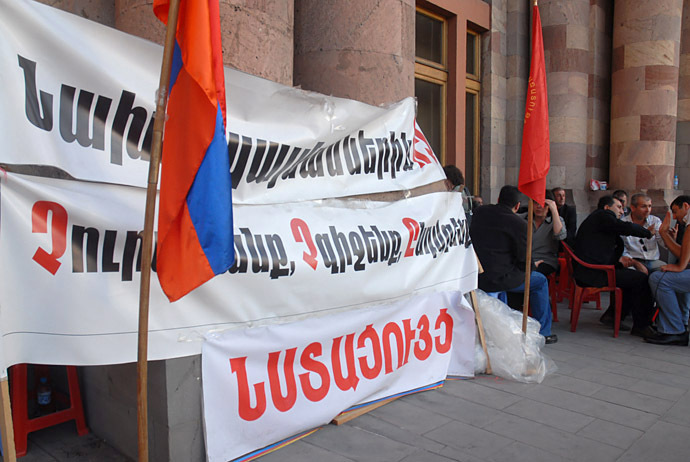 While most were enjoying a sunny afternoon in the Armenian capital, a few dozen members of the Armenian Revolutionary Federation – Dashnaktsutyun (ARF-D) continued their round the clock hunger strike outside the main government building and the adjacent Ministry of Foreign Affairs. The nationalist party is staging the action to protest what many consider to be the likely signing of two protocols establishing diplomatic relations and opening up the country’s border closed by Turkey in 1993 as Armenia and Azerbaijan waged war over the disputed territory of Nagorno Karabakh. Armenian forces currently control about 14 percent of Azerbaijan. Well, it has to be said, as some point out, the action is not exactly a hunger strike, but more like some kind of 48-hour fast with 24 party members refraining from eating until they are replaced two days later. Immediate recognition of the Armenian Genocide and territorial claims on Turkey might be central to the party’s ideology, but the protest is remarkably calm and restrained. 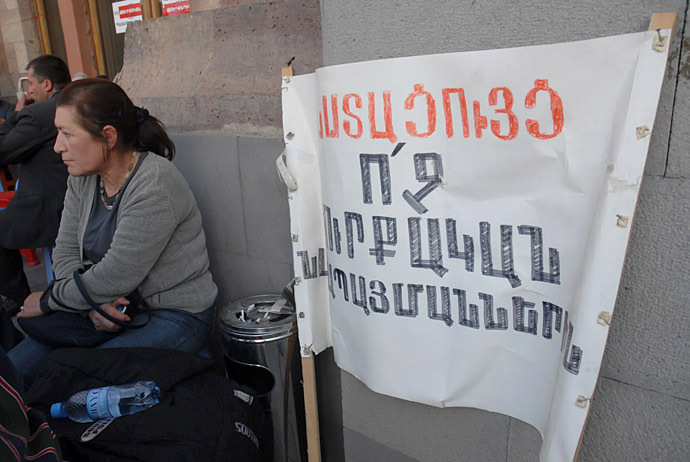 The ARF-D resigned from the government coalition in April, but paradoxically, critics say, the party has not called for the resignation of the Armenian president, Serge Sargsyan, over the matter even though many expect the protocols will be signed on 10 October. Sargsyan is currently on a fasttrack tour of the large Diaspora in order to consult with its various leaders and organizations about the imminent agreement. Small and sometimes violent protests have already greeted him in Paris and New York. The main disagreement, aside from recognizing the Turkish border and abandoning claims on what is now Eastern Turkey, lies with the establishment of a historical commission which outside observers believe could resolve long standing differences over a tragic history. As many as 1.5 million Armenians were massacred and deported in the dying days of the Ottoman Empire and most historians consider this as Genocide. Turkey denies the claims. 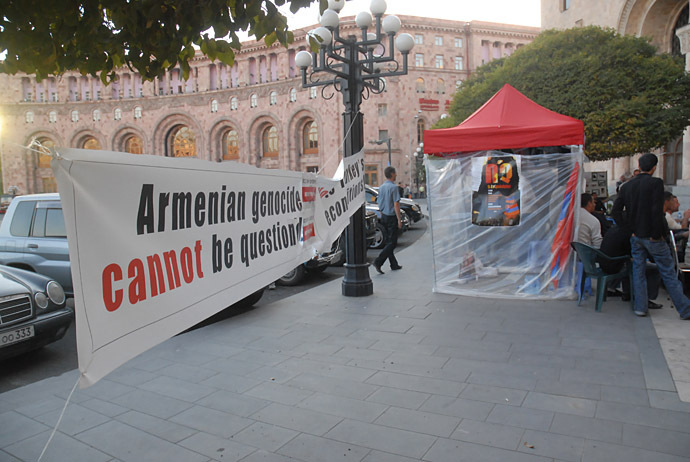 Indeed, the protestors remain adamant that most Armenians are behind them in opposing the deal and are preparing for a rally to be held on 9 October. Approximately 700 people have signed their petition today, protestors add, although they can’t give precise figures for the total number collected so far. “It’s about 60 or 70,000," says one, although few expect Friday’s rally to attract anywhere close to that number, even from a city of 1.5 million and a country a little over twice that size. An earlier meeting last month attracted just 500 people, and although Friday’s rally will likely be significantly larger, for every passerby who put pen to paper today, more didn’t. Nevertheless, unlike even the government let alone the extra-parliamentary opposition, the ARF-D are at least attempting to engage the population. 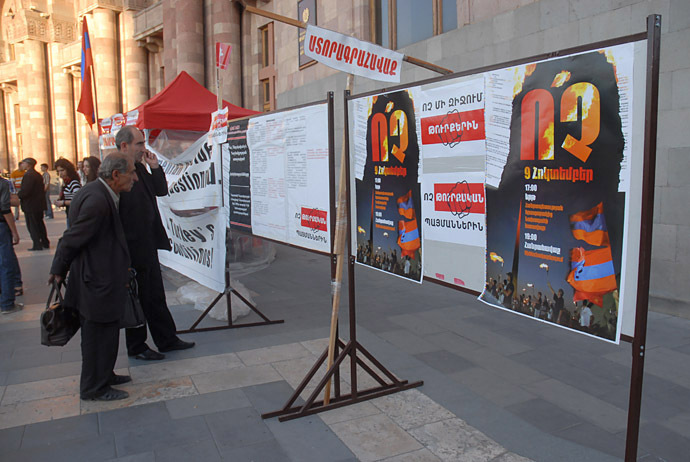 Posters have sprung up on walls downtown and leaflets detailing the party’s position on the protocols have been printed and are being distributed. However, local analysts such as Armenian-American Richard Giragossian consider that domestic opposition to the protocols will remain slight. Armenia is already suffering more than its neighbours as a result of the current global economic crisis and the main opposition parties can hardly hope to exploit inherent fears among the population given their own conciliatory approach when in power. For Armenia, the benefits of a normalization with Turkey are clear. Open borders and normal relations are essential and stand as prerequisites to development and stability. An agreement with Turkey would offer Armenia an immediate end to the country’s dependence on Georgia and would do much to lessen over-dependence on Russia by bringing Armenia closer to the West, while also bringing Europe closer to Armenia. And in a strategic sense, the normalization with Turkey is an imperative for overcoming the two strategic threats now facing Armenia — isolation and insignificance. Of course, this process necessitates a recognition of the past, based on a mutual accommodation of the historical legacy of genocide, but also on a shared perspective of looking to the future. If it succeeds, this agreement must be seen in the proper perspective. […] The issue of normalizing relations with Armenia also stands a key test of Turkey’s strategic future. Another ethnic Armenian regional analyst, Kevork Oskanian, agrees. 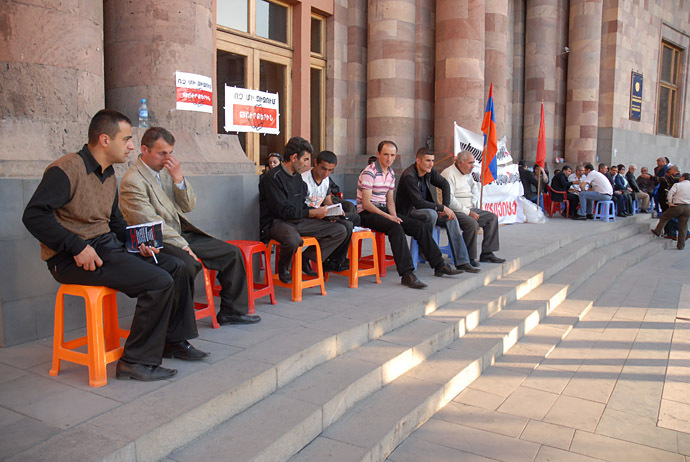 The protocols published by the Armenian, Turkish and Swiss foreign ministries on 31 August have provoked an outcry among both Armenian and Turkish nationalists. […] On both extremes, the reactions were completely predictable in terms of their enduring, fossilised paranoia. […] Focusing on the immediate risks taken by both actors, however, provides us with only part of the picture: these pitfalls are substantial, but so are the potential benefits. On other levels, and in other issue-areas, both Turkey and Armenia believe they stand to gain significantly in the case of a successful rapprochement. 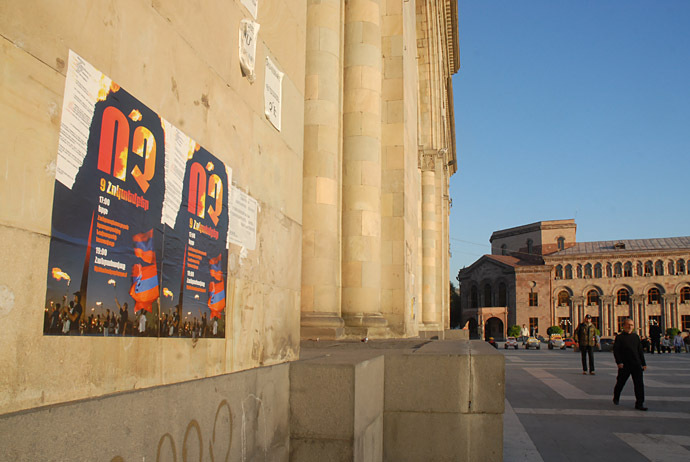 […] Armenia, on the other hand, is growing increasingly concerned at the sight of increasingly disadvantageous economic growth differentials; of the three states, Armenia’s economy has been hit the hardest by the global economic crisis. Yerevan’s more determined push for better relations with Turkey is, to a significant extent, predicated on an understanding that, left isolated, Armenia’s economy will likely continue to underperform its neighbours’ (as it has in recent years, particularly in relation to Azerbaijan), with significant strategic implications in the long term. d and that there are already regular flights between Armenia and Turkey let alone access via Georgia. In contrast, young students approached said they were in favour of establishing friendly relations with their neighbour. 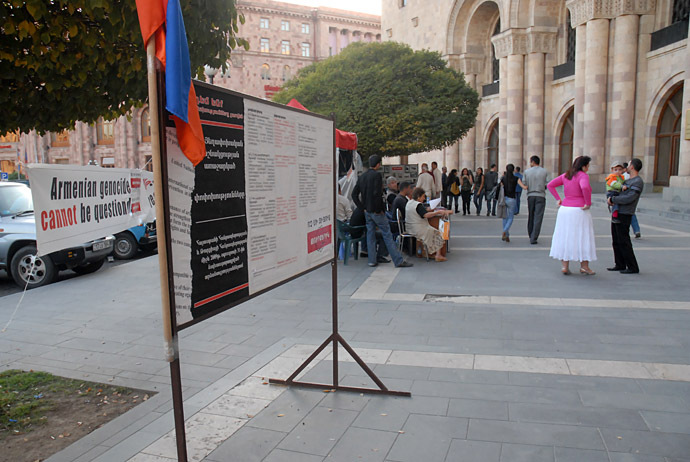 Even so, it is likely that most Armenians are confused and even those against the protocols because they don’t trust a new president elected in a bitterly disputed and flawed vote. The authorities have also not engaged the population sufficiently enough. Instead, many observers suspect, real opposition to prevent any potential breakthrough will come not in Armenia or even its large Diaspora, but rather in Azerbaijan and Turkey. Friday’s rally by the ARF-D will indicate whether they are right. For now, however, cautious optimism seems to be the prevailing mood in the international community with the U.S., France, Germany and others, including some influential groups in the Diaspora, hailing the move in the hope that a process ushering in a new period of peace, stability and prosperity can finally come to the South Caucasus. In the meantime, as I’ll be fixing for Al Jazeera English, the BBC and The Wall Street Journal over the next two weeks, follow me on Twitter at @onewmphoto for updates and new developments.